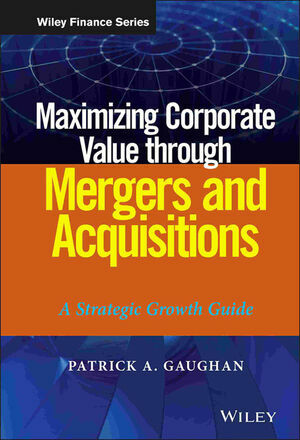 Examining how M&A fits in corporate growth strategies, Maximizing Corporate Value through Mergers and Acquisitions covers the various strategic reasons for companies entering mergers and acquisitions (M&A), with a look at those that are based on sound strategy, and those that are not. With insider guidance on what boards of directors should be aware of when evaluating proposed deals, Maximizing Corporate Value through Mergers and Acquisitions provides a sound foundation for understanding the risks involved in any mergers and acquisitions deal, before it's too late. Patrick A. Gaughan is President of Economatrix Research Associates, an economic and financial consulting firm with offices in New York City; Newark, New Jersey; and Miami, Florida. Gaughan holds a PhD in economics and is a graduate professor of economics and finance at the Silberman College of Business at Fairleigh Dickinson University in New Jersey. He is also the author and/or editor of eight other books.